Pickleball Pro-Am, a great combination for charity! The Pro-Am concept teams a professional player with an amateur to compete and create income for wonderful charities that are being supported by the event/tournament. This is a great fund-raiser idea for pickleball. Well, I was fortunate enough to be able to take part in a special Pro-Am round robin held in Southern California to raise money for PTSD (post traumatic stress disorder – a disorder in which a person has difficulty recovering after experiencing or witnessing a terrifying event). This particular Pro-Am was created and organized by Jeff Donovan from Bountiful, Utah. Jeff is a pickleball player and a champion for PTSD causes. The quick backstory: Jeff’s first Utah State champion pickleball partner Erich Schuette was a husband, father of three kids, veteran, and suffered from PTSD. Eight months after Jeff and Erich won gold at Utah State pickleball championships, Erich took his life. Since September 2016, Jeff has held pickleball clinics and tournaments to benefit Erich’s family, the northern Utah community, and PTSD charities like https://www.continuemission.org. Monies raised for these charities total over $77,500. Isn’t that amazing. Great job Jeff! 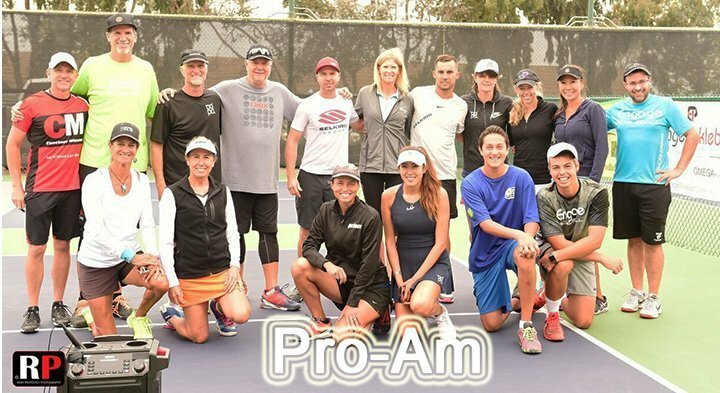 The Pro-Am took place on the eve of the So Cal Classic at the Bobby Riggs Racket & Paddle club in Encinitas, CA. 16 professional pickleball athletes were purchased by amateur players to team up and battle away. Half of the pros had been purchased previously on-line for $800 – $1,000 EACH, so the remaining pros had to but drum up a sale and were auctioned off live. They were quickly purchased and then it was time to play. I was grateful to be pre-purchased because I feared I may have to “walk the plank” ha! It’s always fun to be on the court playing, but in this case it was refreshing to play with and against new friends who shelled out their hard earned cash for the charity. And, of course just knowing you are there in support of and rallying for the cause. Powerful! What a fun-filled 5 days it was at Bobby Riggs Racket & Paddle. Pros and amateurs teamed up 🙂 All photos by photographer Roby Partovich. For more information on the organization of the Pro-Am, click here for Jeff’s website. Great idea for a deserving cause. Thanks, Jen and other pros, for making our sport shine in such a beautiful way. So proud to be a Pickleball player! I taught several years with a friend and colleague who suffered from PTSD stemming from his service in combat in Vietnam, We.were watching sports on tv one day when a helicopter from nearby McCord Air Force Base flew by. Bill dove under the coffee table and pulled me down on the floor, too. This was more than forty year’s after his service to our country. Thank you for your service, Jen, in support of this excelllent cause.